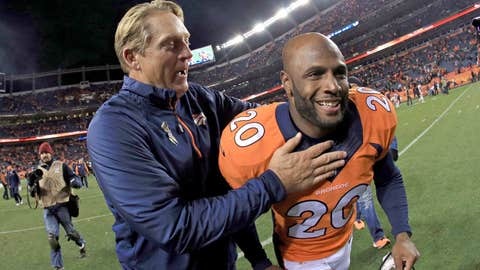 Mike Adams, pictured with Jack Del Rio, has many reasons to celebrate playing in the Super Bowl. Mike Adams checked his phone on Monday. Denver’s win over New England wasn’t even 24 hours old, and he had 144 text messages and 44 missed calls. Everybody wanted to congratulate the Broncos’ safety and/or hit him up for Super Bowl tickets. Adams grew up not far from MetLife Stadium, so his popularity had quickly soared. But if they had to confess, how many old friends never truly thought Adams would home a conquering hero? The fact he did makes him perhaps the Super Bowl’s most grateful player. If the media break away from Richard Sherman or Peyton Manning long enough to notice next week, Adams may also stop being one of football’s most anonymous players. “Obviously, he’s no slouch,” his old high school coach, John Iurato, said. He’s a 10-year NFL veteran. For all most people know, however, he could be the Mike Adams who plays for the Steelers. Or maybe even the Mike Adams who pitches for the Phillies. This Mike Adams is clairvoyant. When the NFL awarded Super Bowl XLVIII to the New York/New Jersey area in 2010, he told people he’d be playing in it. The crazy part is that he was playing for the Browns at the time. It takes a lot of faith to believe in Cleveland, but Adams could be the NFL’s patron saint of lost causes. There was no bigger one than himself. Adams is one of eight children, raised by a single mother. One of Sharon Adams’ main goals in life was to see that none of her children had to attend Eastside High. It was the school depicted in the movie “Lean on Me.” Morgan Freeman played Joe Clark, the hardnosed principal who tried to clean up Eastside’s act in the 1980s. By the time Adams came along, all the bad actors had returned. The state eventually took over running the local school district. Iurato was the coach at Passaic Tech. It was just across the river in Wayne, but far enough away from the crime and grime that gives Paterson its reputation. A friend recommended he take a look at Adams. Adams helped Passaic Tech win a state title, but college recruiters hardly noticed him. He ended up a Delaware Blue Hen. Adams’ time there was marred by a broken leg and a dislocated hip. He spent almost three months on crutches and basically had to re-learn how to walk. One day, an assistant coach leveled with him. “It made me feel like lifting weights,” Adams said. No team cared enough to draft him, so he signed a free-agent deal with the San Francisco 49ers. It paid $2,700 a week, which was nothing by NFL standards but not bad for a Paterson kid just out of college. Adams could not enjoy the moment. As training camp opened, his mother died from ovarian cancer. She was 38. That was depressing enough. Throw in the pressure of a rookie nobody trying to make an NFL roster and it was too much. Adams had searing headaches but didn’t complain. Then he awoke one morning and opened his eyes. They wouldn’t focus. He was all but blinded by the tiniest ray of light. He put a towel over his head and was taken to the hospital. “They couldn’t find anything,” Adams said. It was simply a stress overload. Adams went back to practice and tried to concentrate on making the team. Rashaun Woods was the hotshot receiver San Francisco had drafted in the first round. Adams glued himself to him. “I went against him every day and dominated,” he said. The No. 1 pick from Oklahoma State was out of the league in three years. The Blue Hen nobody wanted made the 49ers practice squad and became a part-time starter his second year. The average NFL career is 3.3 years. Adams’ is three times that long and counting. He started 50 games in his first eight seasons, most of them spent with the Browns. The Broncos signed him as a free agent two years ago, and he’ll start at free safety on Feb. 2. If Adams had played for a contender all those years or called Michael Crabtree a mediocre receiver, more people might know his name. His success was not lost on the people back home, however. Adams went to a funeral a few years ago and nodded hello to a stranger. They headed in opposite directions, then Adams’ aunt grabbed the stranger by the arm and dragged him back. “You know your son plays football?” she said. He walked away, and that was that. The extent of Adams’ lifetime interaction with his father. The anger he felt that day has melted into sadness. Especially now that Adams has a daughter and realizes what his father missed. Adams knows he’s far from the only son of Paterson who feels that way. He’s resolved himself to change what he can. He started a foundation with Gerald Hayes, a Passaic High teammate who played in the NFL from 2003-11. It sponsors mentoring programs, food drives, a youth-league football team and even pays for 100 haircuts before the school year. The only requirement is that everyone who participates must provide some type of community service. It would be nice to say it’s made a big difference, but Adams doesn’t think his old neighborhood is much safer than it was 20 years ago. He does. Adams lives 20 minutes away in Parsippany. He returns to tell kids how to become the next Mike Adams. It’s a name worth remembering. There’s no telling where they’ll end up. Maybe even in a Super Bowl.